Surfacing today in the warehouse was a collection of papers, all bound together punch-bound in a makeshift manila binding, all on the subject of mechanization and its impact on the migrant worker, and all from 1936-1938 or so.It was the mechanization of farming chores following the recession after WWI which contributed to over-farming and over-production of farming land, and that, combined with with this soil erosion with drought, contributed to the Dust Bowl and the vast migration of the Great Depression. Among the papers on new farm implements and the millions of people on the move was “The Child in the Migratory Camp—Health”, by Edward J. Rowell, a slim but telling four pages on the plight of kids in migrant camps. This paper was published in California Children, Sept 1938, pp 1-4, and is referenced in James Noble Gregory, American Exodus: The Dust Bowl Migration and Okie Culture in California, p 289. It is a very sobering read, and I reproduce it below in full as there are but a few references to it. I've uncovered today a small packet of mimneographed publications from a famous labor/civil rights school in the mountains of Tennessee. The Highlander School in Monteagle, Tennessee, was a training/leadership/educational center founded in 1932 for Southern labor activists and, later in the 1950's, a training center for civil rights activists. One of the categories that this post has been filed in is "A History of Blank, Empty, and Missing Things" but really only for the document displayed below, which is an unfilled-in form for attending one of the sessions at the school--there's a curious collection of such things here, from naval sea logs to Nazi diaries for Warsaw and other such things. It is an interesting experience to look at such a blank-filled document, a document that doesn't bear someone else's marks and expectations, and imagine your own answers to it, unencumbered. The letterhead on one of the publications including the governing body of Highlander, including the well-known names of Dombrowski, Myles Horton, and Zilphia Mae Horton--that last name is probably familiar because of her work in folk/civil rights music like her reworked versions of "Keep Your Eyes on the Prize," "We Shall Not Be Moved," and "This Little Light of Mine", and then most famously (with Pete Seeger, Frank Hamilton, and Guy Carawan) on "We Shall Overcome". Also from the group I've included scans (on the left, below) of a summary of what the Highlander School was (in 1942), and then (at right) the covering title and art for the May 1942 "Southern Workers School). I can't recall seeing Adolf Hitler portrayed in an editorial/political cartoon as being part of a race riot in the U.S., though it does make sense, and also makes for a very strong message. The artist here--Bernard Seaman--was a busy guy working for labor and social organizations like the ILGWU (International Ladies' Garment Workers Union) and newspapers like the superb leftie PM, and he chose Hitler to exemplify the great divisive wrong in U.S. society, "the foul blot upon our best American traditions..." and quote President Roosevelt to underline it all: "Remember the Nazi technique: pit race against race; religion against religion; prejudice against prejudice; divide and conquer". This image appears in a pamphlet without a clear, recognizable title, and was published ca. 1943/4. Displayed below is one of the many dozens of graphs/charts/maps created with the data collected for the 1890 and tabulated by William Hollerith's glorious machines. It was the first use of the machines for the U.S. census and they offered a far-reaching and increased ability to tabulate and organize the data. The 1880 census had cost about $6 million and took 9 years to tabulate; the 1890 census using the Hollerith machines cost $10 million and took seven years. The main focus of many in government was the cost differential—not the incredible amounts of new controllable information. The rent of the Hollerith machines was only $750,000 for the conduct of the entire census, so the differential must’ve been in the extra utility costs (for electricity, for example, which was used for the first time to run the tabulators) and for the small army of statisticians and data entry people. Be that as it may, the government was not amused, particularly when Hollerith figured that he had actually saved the government $5 million. The two parties left each other grumbling, though the roar of the trickle down from the Hollerith success drowned it out. The tabulating system was quickly exported, and large private concerns in the U.S. saw a savior in the system that would soon rescue them from the sea of paper in which they were beginning to drown. The Hollerith company did very, very well for itself, and soon merged with three other companies (in 1911) to ease the burden of success. The resulting company was called the Computing-Tabulating-Research Company (CTR), which after a short while became the International Business Machine Corporation (IBM). The masks devised to deal with the gas attack of WWI were sometimes effective, sometimes not--and sometimes they were occasionally lethal enhancers. The earliest masks were creepy, unworldly, Coraline-like burlap-and-button-faced affairs--I'd hardly want to imagine seeing thousands of these guys come running up to me with rifles and grenades in their hands attacking my position (as we can see in the image below of an attacking British force at Loos in 1915). And yes, of course, they started out as "anti-gas masks" because that is what they are--the "anti-" prefix is dropped not long afterwards. There is almost nothing so spirited and heartbreaking and proud than people who find themselves in very difficult situations and who try to provide for themselves some comfort of a peaceful time, something far away from what they are experiencing, something that calls to some sort of peace and normalcy. An this is what we have here, for me, in this picture of a French soldier and his unit's jury-rigged automatic shower. From the looks of the engineering, I'm assuming that the ting worked just fine, and I am certain that it provided no end of relief for those able to use the machine. You'll notice that teh soldier is also standing on a very small piece of wood elevated above the ground, so that the bather's feet don't become muddy. 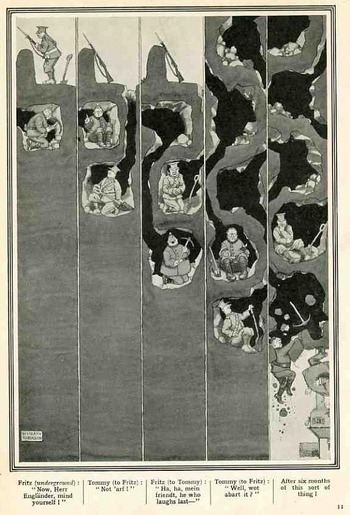 The caption makes note of the drawings of Mr. Heath Robinson (1872-1944) who was a lovely, quirky, charming, skewed, dark, stiff-bouncing and creative illustrator capable of considerable whimsy (light and complex) and deep skepticism. It really does a small disservice to the battlefield engineers who built the shower--the thing is really pretty elegant, and seems to be quite light in spite of its size. Those guys did a good job. 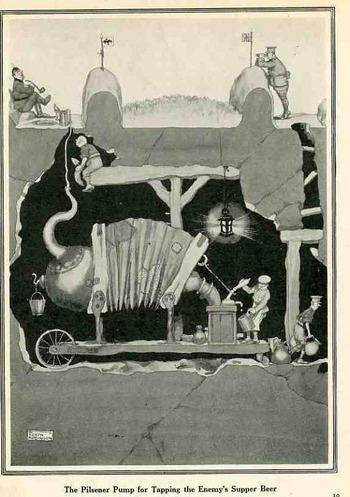 The two following images are from one of his three WWI books, Hunlikely, published in 1916 (Some "Frightful" War Pictures (1915), and Flypapers (1919), were the other two) and depict scenes from the intra-trench tunnel wars, which were battles fought in the midst (or, actually, beneath) other battles. This was a savage, grueling, post-adjectival affair—exceedingly dangerous, difficult, awful. And it happened a lot during the war, given the experience of stalemates between vast armies sunk into mole city trenches, with no one going anywhere for long periods because there was nothing in between the two impervious lines but a death vacuum. Now, that is quite a name for a product--for a glow-in-the-dark product, for something that will not darken. The advertisement displayed here was for a product that "doesn't get dark in the dark", and appeared in the Scientific American on May 1, 1920. The particularly cringeworthy part of Undark, viewed from the future of this advertisement, is that the spots of light on the wall and etc. that make Undark what it was was an applied radium paint. And it was the famous or infamous case of "The Radium Girls" (that really brings the cringe into sharp focus, as it was this same company and product that was being advertised (left) that brought all of those workers into their sometimes-lethal encounter). The women were workers for the U.S. Radium Corporation--which started out its business life as the Radium Luminous Materials Corporation--who worked with radium and luminous paints and who contracted radiation poisoning from their close contact (and ingestion) of the paint, a result of "sharpening" their paint brush tips by touching it to their lips and tongues. The injurious effects of radium was well known to the chemists and executives at U.S. Radium, but that information was kept from the women hired to apply the paint to (in this case) watch dials. Historic litigation ensued in the early 1920's, and when the case was settled in 1928 the workers received relatively modest settlements--the result of the case though was wide-reaching in labor rights law and also in occupational health and safety--all of that was a lot more valuable than the $10k payment and $660/year annuity awarded to the Radium Girls. Evidently the inventor of the first radium-based luminescent paint, Sabin Arnold von Scohocky (1883-1928) developed aplastic anemia (a developing deficiency and failure to produce all three blood cell types) most probably as a result of his prolonged exposure to radioactive material. Marie Curie, Max Valier, Otto Lillienthal (and so on) also died as a result of working on their discoveries/breakthroughs, though what ultimately cost von Scohocky his life was nowhere near as significant as the work of the other three. Evidently the U.S. Navy determined to sell off some segment of its seaplanes 18 months after the end of WWI. The half-page advertisement appeared in Scientific American for May 1, 1920, and promised "planes are new--never have been flown". There is no mention of how many complete aircraft were available for purchase, though it is stated (with a little detail) that eight different types of seaplanes and flying boats, priced from $2000 to $12,000, were available--all of which could be purchased with just 5% down (and the balance paid out to the U.S. Navy in 30 days). I was just looking for a good link for the full text of Donald Knuth's 1965 paper on "Very Magic Squares" when instead I found mention of his earliest publication, a playful paper that was published in MAD magazine in issue #33 for June 1957. The work by the 19-year-old Knuth, "The potrzebie system of weights and measures", suggested that, among other things, the "potrzebie" as a standard unit of measure--and that was equal to the width of the issue #33 or 2.263348517438173216473. There were more fanciful measures for Knuth, which suggests that these "standard" units are infinite, one measure of infinite being the length of the finite over its negative. This brings us to measuring things in terms of units of Mt. Everests found in this short notice in Popular Mechancis for September 1933. Truthfully this is a simple dataviz tool, comparing the depth of one unknown and not visualized entity--in this case, the "deepest spot in the Pacific"--with another that is known and highly visible (after a fashion), and so we get to appreicate the great depth by comparing it to Mt. Everest. There are no stackings of Everests in this image though I can see a future use for the visual--I have after all posted many unusual pieces to this blog where heights/depths are measured in terms of stacks of Eiffel Towers, or mammoth bread, or gigantic piles of wood, or nails, and uprighted ships, and of course numerous Great Pyramids filled with excavated dirt from the digging of the Panama Canal and stretched over the island of Manhattan. Those are more involved, while the present unit of measure is just suggesting itself for future use. On the other hand it might be more beneficial to use stacks of the Empire State Building to convey the sense of deep depth. In 1933 it was just two years old and a world-wide sensation as an icon art deco building and the tallest building in the world, so if you said that the deepest depth could absorb 32 Empire State Buildings one on top of the other, there may have been a greater understanding of the consequences of that much depth. In any event, I like that more as a unit of measure.